In this post I'll dive into the third API security attack scenario and what is required to effectively defend against it. Full source code for the demo is available on github if you want to play around and try things out for yourself, but it’s not necessary to gain an understanding of the exploits and defenses I’ll be demonstrating. If we MitM (man in the middle) the API traffic again, we still see the "SF-HMAC" header. Okay, it looks a little different this time round. There is a lot more 'noise' between the static secret we discovered earlier and the initialisation of the HMAC. We added this obfuscation ourselves, but it should be noted that there are commercial tools available which achieve the same goal automatically. 1 The algorithm is still "HmacSHA256"
3 The secret key is computed using a combination of static and dynamic data. Looking at the decompiled code, we see there are multiple variables involved in computing the secret, but the result still ends up being a single parameter to the "SecretKeySpec" object constructor. In order to break this, we need to run the app and find out what that first parameter is. We can then resign the APK and run it on an emulator or device and debug it in order to derive the HMAC key. There is another option available which avoids the need to modify the original APK to include a debug flag. We could use a dynamic instrumentation framework such as Frida and follow along the docs to create a script which can dump the HMAC key when required. Frida is capable of attaching to a running process, poking around that process, then detaching from it and leaving it in the original state. Ouch! To run this, however, we do need to be on a rooted/jailbroken device or emulator. There are other such frameworks to modify apps on rooted/jailbroken devices such as the Xposed framework for Android. I recommend you check out the video on YouTube to see how Xposed is used to break TLS certificate pinning. 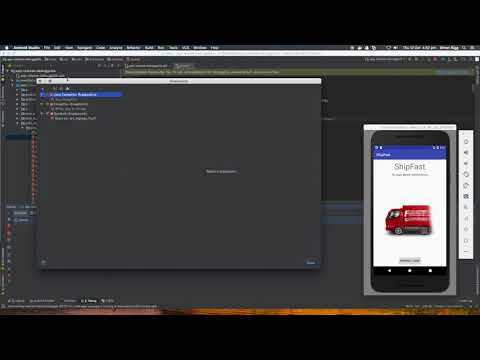 In this walkthrough though, we will choose the option to enable app debugging, unzipping the APK, adding the debug flag to the manifest, zipping the APK and resigning it before running it on an emulator. In Android Studio, we add a method breakpoint to the "javax.crypto.spec.SecretKeySpec" constructor which accepts the key and algorithm as parameters. When we run our app and trigger an action to perform an authenticated API request, such as fetching the nearest available shipment, we will break on the constructor of SecretKeySpec and see the computed HMAC secret. Using a debugger also makes it possible to step through the code and learn about the algorithm so we can replicated it in the rogue ShipRaider website. If things are configured correctly, you should now be able to run ShipRaider against the ShipFast server and grab those bonus shipments, even although we have migrated to using a dynamic secret key for the HMAC used to sign API requests. It is possible to build on the previous defence by use of a more sophisticated dynamic key for the HMAC. One option would be to introduce code to compute a signature of the app's APK at runtime, something similar to the V1 and V2 signatures already included. We could also verify the signing authority of the APK to ensure the app is not repacked and resigned by someone else (I'm looking at you, ShipRaider pirates!). This information could all be tied to the API request HMAC to add further protection. We need to be careful with root/jailbreak detection as there are methods of circumventing these on mobile platforms such as RootCloak and Hide my Root on Android, and tsProtector on iOS. A quick online search for "detect android root from app" or "detect ios jailbreak from app" yields results which developers typically adopt to protect these environments. This knowledge has been used recently by the online community to work around root/jailbreak detection on popular app store apps and unlock protected features. For the ShipFast company to ensure its shipment service is protected from attacks such as those suggested in this walkthrough, the API server running in a trusted environment must ensure it can authenticate code running in untrusted environments such as mobile devices. It must authenticate the mobile app and its environment at runtime, in addition to authenticating the user and the network channel. Although it is possible for ShipFast to develop a suitable solution themselves, this requires sophisticated mobile device and cloud server security knowledge and experience, incredible creative and persevering penetration testing, the ability to analyse, identify and adapt vulnerabilities yesterday, and a great deal of time (I hear flux capacitors are good for this too). If ShipFast fail to act quickly and effectively, their profits will be hit badly and their reputation could be severely crippled. 3 Is easy to integrate and quick to deploy via a cloud service and mobile SDK for Android, iOS and hybrid mobile platforms without impacting customer experience. Nimses, a multi-million user base customer with API data-scraping problems went live with Approov in just over a week. For this defense, we will walk through the process of integrating Approov into the ShipFast mobile app and backend Node.js server and demonstrate its effectiveness in protecting the ShipFast web API from those pesky ShipRaider pirates! * Intercept the given request chain to add the Approov token to an 'Approov-Token' header. We also need a solution to mitigate stealing of the Approov JWT by MitM attacks, so we provide a custom Hostname Verifier which ensures the TLS connection used by the app to perform authenticated server API requests is tracked by Approov. Essentially, if the connection to the Approov Cloud Service or any protected API endpoints is proxied, the Approov authentication process can track that and provide an invalid token. It is worth noting here that Approov achieves this "dynamic TLS certificate pinning" without you having to embed any certificate data in the app and worry about updating it when a certificate expires or the certificate's private key is compromised. Approov will keep up with changes to your API certificate. The custom Hostname Verifier is provided in the app/android/kotlin/ShipFast/app/src/main/java/com/criticalblue/shipfast/ApproovHostnameVerifier.kt file. If you are unfamiliar with the concept of hostname verification this file may look a little daunting, but I will attempt to explain it a little here. A hostname verifier verifies a particular host used in a particular HTTPS connection. Before the "HTTP" part, layer 7 of the OSI model, the "S" part, layer 4 of the OSI model, must first be established. That is, Transport Layer Security must be applied. You can read many documents about how this uses asymmetric cryptography and X.509 certificates in a handshake to establish a symmetric shared key between the client and server used to encrypt, decrypt, sign and verify network traffic; but prior to this phase, the hostname verifier allows apps to customize the validation process of the host server and we use that to synchronize the current network session for an API request with Approov so the Approov token's validity can reflect the validity of the host server certificate. If we are talking to the real thing, we should get a valid Approov token. If API traffic is intercepted by a proxy decrypting and re-encrypting API traffic so it can spy as a MitM, then we should get an invalid Approov token. So why use a hostname verifier and not just set all this up front as a 'pin set' in the trust manager and then use that for API requests? That is why it is dynamic pinning, and how we avoid the challenge of playing catch-up as many certificate pinning solutions are faced with when a certificate expires or in the unexpected case when the private key used to sign the certificate is compromised and a rapid emergency fix is required. Dynamic pinning allows you to adapt to any eventuality without notice and without requiring a new release of the app. In addition to this, dynamic pinning is more secure as it doesn't suffer from the fact that static in-app certificate files can be replaced and the app repackaged to use a rogue certificate pin set. The Approov Token Secret is the base 64-encoded HS256 symmetric secret you are given when signing up for the Approov service. It is what the Approov Cloud Service uses to sign short-lived Approov JWTs, and what your web service will use to verify these tokens for protected API requests. The app does not and should not know whether these tokens are valid (i.e. signed correctly and not expired). If your app is genuine and untampered and passes the Approov authentication process, you will be issued with a valid Approov JWT; otherwise it will be an invalid one. The mobile app is simply a carrier of this token. 1 Try modifying ShipRaider to include a fake Approov token, or use the Linux cURL command or equivalent to perform fake API requests to the ShipFast server. In other words, try using the ShipFast API without the genuine Approov-registered app. Be as sneaky as you can - attackers will be! 2 Take the Approov-registered APK, unzip it, try changing something such as adding the debug flag to the Android manifest as we did in a previous attack, re-sign it, install it and run it on an unrooted device. Even without debugging, the app modification of the APK will be detected by Approov as the signature has changed. 3 Follow the previous step, and attach a debugger to the app. Approov detects the presence of the debugger. 4 Try running the original Approov-registered app, unaltered, on a rooted device. 5 Try running the original Approov-registered app, unaltered, on an emulator. 6 Try proxying network traffic from a device to the ShipFast server. Use an SSL proxy (MitM attack) such as Charles or mitmproxy to snoop the API requests. 7 Try attaching an instrumentation framework such as Frida or Xposed to the Approov-registered app. Install a TLS certificate 'unpinning' framework to try to circumvent MitM mitigation. IMPORTANT: Approov's app and API protection features can be enabled and disabled by contacting us. These features will not all necessarily be running during your penetration tests, so please check the status of your Approov Cloud Service first before attempting to elevate our engineering team's heart rate considerably. In all seriousness though, we are confident that Approov provides highly-competitive app and API protection (and we have the customers to back that statement up) so if you do have any concerns or queries, please get in touch using the form at https://approov.io/contact-us.html or, depending on the situation,https://www.criticalblue.com/careers.html. I sincerely hope that you have enjoyed this walkthrough and found it useful, and thank you for reading it! I hope that it is clear that API protection needs not only to authenticate the user with techniques such as OAuth 2.0 and Open ID Connect, and authenticate network traffic using Transport Layer Security and certificate pinning; but also authenticate the running mobile application. The combination of these provide a crucial synergy of API protection techniques. You know who is talking to you. You know how they are talking to you. Do you know what is talking to you?